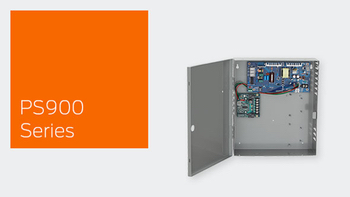 Schlage 900 Series Power Supplies are ideally suited for the access control industry and its constantly changing needs. Racks and side connectors are a thing of the past with the simplified, flat mounting design. The 900 Series has a constant output rating of both 12v and 24v settings as well as universal 120 VAC to 240 VAC input. Outputs can be configured as switched or unswitched power with the new fire alarm interface board mounting.